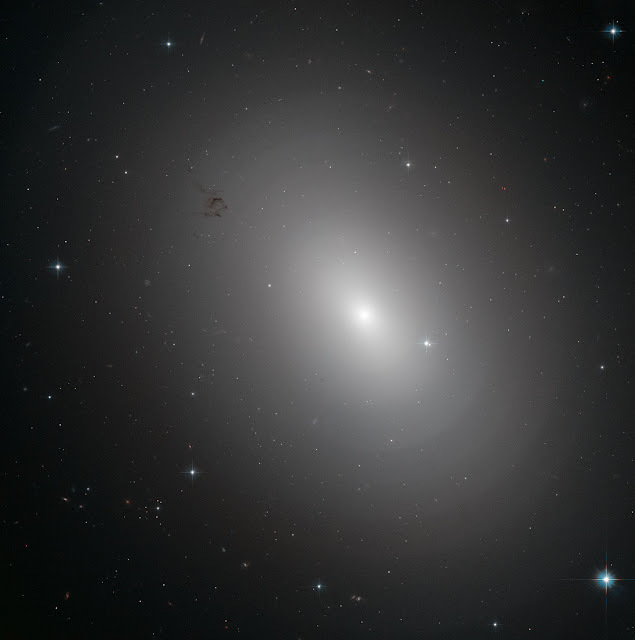 The glowing object in this Hubble Space Telescope image is an elliptical galaxy called NGC 3923. It is located over 90 million light-years away in the constellation of Hydra. Finding concentric shells of stars enclosing a galaxy is quite common and is observed in many elliptical galaxies. In fact, every tenth elliptical galaxy exhibits this onion-like structure, which has never been observed in spiral galaxies. The shell-like structures are thought to develop as a consequence of galactic cannibalism, when a larger galaxy ingests a smaller companion. As the two centers approach, they initially oscillate about a common center, and this oscillation ripples outwards forming the shells of stars just as ripples on a pond spread when the surface is disturbed.